With the inclusion of so many portable electronic devices in our daily lives, motorists are forming a terrible habit of dividing their attention between electronic distractions and the task at handarriving safely at their destination. In fact, statistics from the Center for Disease Control and Prevention (CDC) report that each day 9 people are killed and over 1,000 injured from distracted driving incidents nationally, and the problem seems to be escalating. Have you or a loved one been the victim of an auto accident because of a distracted drivers reckless behavior? Are you aware that you may be entitled to compensation for the physical pain you endured, as well as the mental and emotional anguish you suffered from the crash? To find out how we can help, simply fill out the Free Case Evaluation form located on the right side of this page. The details of your case will always remain confidential and there is never any obligation to proceed. It is always 100% FREE. Unfortunately, there is a specific demographic who are more apt to perform distracted driving activities. Cell phone laws vary by state, and in some cases cell phone bans have helped crack down on this behavior, but no one is immune. The following are the most commonly reported risk factors associated with distracted driving accidents. Drivers age: Drivers between 16 and 19 are most commonly cited as engaging in distracted driving behaviors. Reportedly over half of all high school students use smart phones to check email or send messages while driving. This group has the highest proportion of distraction-related crashes. 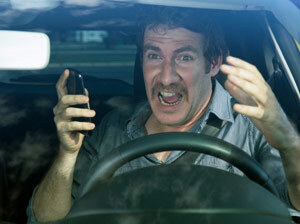 Specific activities: Texting while driving is the leading culprit in distracted driving crashes. Data suggests that engaging in specific activities such as texting, reading emails, talking on a cell phone automatically put a driver at an increased risk for an auto accident. Drinking or drug use and driving: Teens who text message are statistically more likely to accept a ride from a driver who has been drinking, or to get behind the wheel after they have been drinking. Drugs and alcohol impair the brain and slow reaction time. When this behavior is coupled with other distracted driving activities the results can be catastrophic. Cognitive: Distractions of the mind that take focus off of driving. Manual: Physically performing another action which impedes driving ability. Visual: Taking eyes off of the road. Any combination of these distractions can cause an accident, but most of the time they occur in pairs or all at once. As an example, a driver who receives a text message and checks their phone is being cognitively distracted by the content of the message, visually distracted by averting their eyes from the road to read it, and manually distracted by operating their phone to open the message, or worse, send a response. These distracted driving behaviors have proven time and again to be reckless and fatal for those who share the roadway with the negligent motorists who display them. If you have been injured because another driver was distracted behind the wheel, do not suffer in silence and allow them to continue driving irresponsibly and putting others in harms way. The lawyers of Harbin & Burnett feel that justice should be done to provide you and your family with peace of mind during an extremely trying time. We will always fight for the rights of our clients and represent them fairly and competently in court. Our attorneys at Harbin & Burnett understand that being involved in an auto accident can bring many emotions and cause an enormous amount of pain to the victim and their family, especially when the accident was caused by the actions of a distracted driver. Our team will work tirelessly to seek the MAXIMUM amount of compensation benefits for each of our clients and help them achieve the justice they deserve. With our office located in Anderson, South Carolina we are able to serve throughout the entire state and elsewhere. If you would like to obtain more information about our law firm, we encourage you to call us at (888)821-0247 today and speak to one of our lawyers about the merits of your distracted driver accident injury claim. At the law offices of Harbin & Burnett, we're here to help.